Tomorrow night is our April Monday Market Mingle, 5-8pm at the Rec! Join us for some wonderful pre-Easter shopping. Say hello to returning favorite Skyline Drive Orchard, look for new products from HENNY FAIRE Co. , and check out the debut of Conebella Farm Cheese's cultured butter, pictured below! See you tomorrow evening. For a list of all of our vendors and specials, click through for our market newsletter. Macungie Mountain Herb Farm will be bringing Organic Chicken/Vegetable Soup with Basil and Quinoa...also Sourdough Bread and Rosemary Herbed Focaccia...in addition to our Fresh Squeezed Lemonade and Farm-Grown Herbal Teas and Tea Blends. See you there! For those hoping to get some Conebella Farm Cheese - they will not be at the market today. A family emergency has them away from the farm and unable to attend. Everyone is OK, but they're where they need to be right now. Great excuse to take a drive to their farm store to get your fix before the April market! 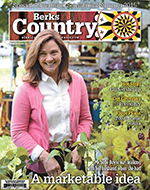 Our Antietam Valley Farmers & Artist’s Market – May 27th cover story. Thanks to our friends & neighbors for making it possible!